The next meeting of the Arklow Geraldine’s Ballymoney Club Executive will take place in the Wicklow County GAA Board Room in Pearse Park on Wednesday the 3rd of September 2014 at 8pm. To be in with a chance to win All-Ireland Final Tickets get to the Bridgewater Shopping Centre on the 30th of August and buy a ticket to get your name in the hat. Draw on September the 2nd. Calling all musicians, singers, actors, dancers!! Join Kathryn from September in Gaelcholáiste na Mara. All interested 6 – 17 year olds should meet from 12pm to 2pm on the 4th Sunday of each month, beginning on the 28th of September. Contact Kathryn on 086 8664931. For poster see: Scór na nÓg at www.arklowgaa.com. Club gear is available at great prices. AGB T-Shirts for €7, a hoodie and T-Shirt for €30. Contact Kerry on 0873287881. 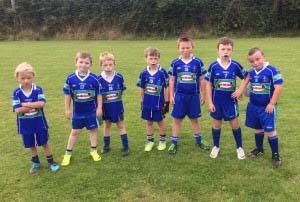 The U8/U7 boys hosted a challenge match against a very experienced Castletown of Wexford on the 23rd of August. The lads showed great commitment and energy and there is no doubt that fixtures like this will help to develop their match skills into the future. Many thanks to Castletown for making the journey. 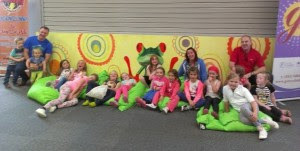 The U8 girls had a fun day out in Adventure Alley, Gorey, on Saturday the 23rd of August. The girls had a great day out as a team. Thanks to everyone who helped out. The U12 Div2 girls played St. Pats on the 21st of August. St. Pats started brightly and led 1-1 early in the first half but as the AGB girls started to dominate they got no more scoring chances in that half. AGB got some well worked scores from defence up to midfield and onto the forwards and led 1-4 to 1-1 at the end of the first half. The second half was dominated by AGB with quick points from the girls. The defence was very strong and held together. St. Pats scored a late goal but this was answered with a goal from AGB. Final score AGB 2-8 St. Pats 2-1. It was a fantastic performance by all 16 girls on the team, made up of two U9’s, ten U10’s and four U12’s. Every single girl put up a commanding performance and height difference didn’t matter to the girls has they won a lot of possession in the air. Well done girls. Next up is championship, away to Blessington on Tuesday, September the 2nd. The U12 Div1 girls play their first championship game on Thursday the 28th of August against Baltinglass (away). A match against Castletown on Monday the 25th of August and a match against Blessington on Friday the 29th of August. The Senior Ladies will take on Baltinglass in the County Final on September the 7th after defeating Tinahely in a nail-biting encounter on Saturday last. Tinahely made the stronger start with three early points but from there it was nip and tuck. The Arklow back line had to work extremely hard to repel the constant attacks. Going in at half time Arklow had powered ahead by six points, leading 3-5 to 0-8. Tinahely made a very determined start to the second half. Arklow conceded a penalty for what referee Anthony Nolan judged to be an unfair tackle in front of goal but the twice rebounded ball was converted into an AGB score with Caitriona Byrne rattling the Tinahely net. The final score was AGB 4-6 Tinahely 1-13. This was a super effort from two hard working teams and great entertainment for the considerable number of spectators that turned out to support them. For full report see: Senior Ladies Championship Semi-Final Report at www.arklowgaa.com.